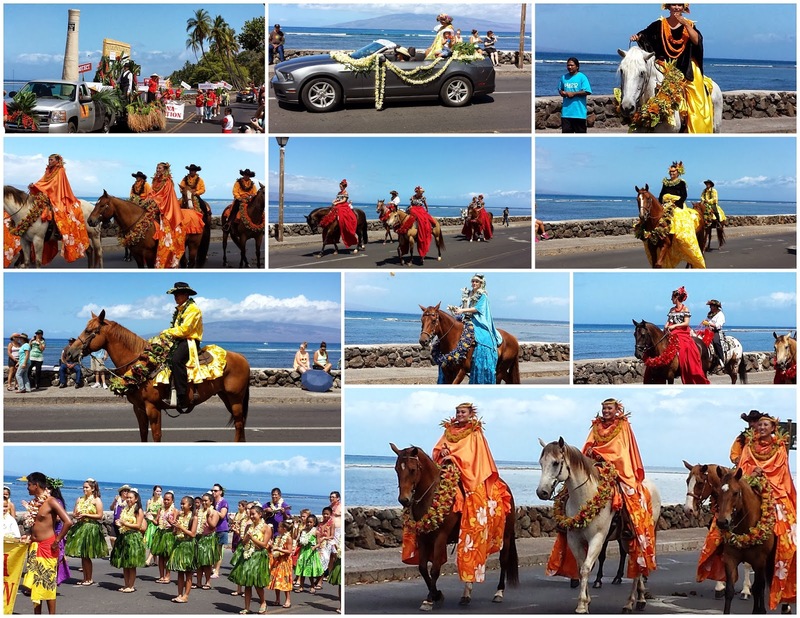 I love parades, and whenever there is a chance to enjoy one here in Maui, I'm in (remember the Whale Parade?). June 11 is King Kamehameha Day in Hawai'i, and it is a paid holiday at my job. If I'm getting the day off work, I need to know why. King Kamehameha the Great was the monarch who established the unified Kingdom of Hawai'i. Local friends told me that I shouldn't miss my first King K parade - especially the horses. The highlight of the parade, for me, were the pa'u riders. Riders and their horses are decorated in beautiful homemade leis. Each island was represented with different flowers and colors. Horses first arrived in Hawai'i in the early 1800s and a paniolo (cowboy) culture developed as well. The parade came down Front Street in Lahaina, and was not on the holiday itself, but on the following Saturday, along with crafts, music, and food under the Banyan tree. If you are in Hawai'i next year over King K Day, be sure to check for activities and parades.